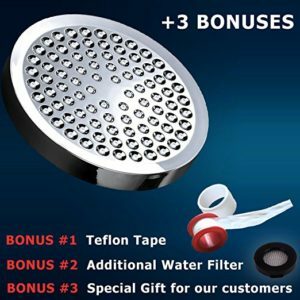 / Top 3 Picks For Best Rain Shower Head For Low Water Pressure! Last Updated: April 12th 2019 ​Low water pressure is an absolutely nightmare and anyone who suffers from it knows exactly how inconvenient it can be. A lot of the time there isn’t even anything you can do to change it as it’s an issue with plumbing in the general area. That being said, in this guide we will be sharing our top 3 picks for the best rain shower head for low water pressure ridden homes! If you have low water pressure it can turn showers from a relaxing experience to a real struggle. With low pressure the water flow is inconsistent and often almost impossible to use. It can be difficult to get clean and can mean your shower takes a lot longer than planned. Low water pressure makes even some of the fanciest showers useless as a lot of the different features just don’t work. In recent years rain showers have become the most popular. This feature is simply when water is evenly dispersed from directly above to give the feeling of warm raining coating your skin and helping you unwind. It’s been proven as one of the most effective ways to help with aching muscles and body tension. Along with this, if you are looking to spice up your shower a bit, then checkout some shower heads with speakers attached to them! Of course for those with low water pressure rain showers just aren’t practical. They require an even amount of water in order to give the true sensation of rainfall and without that you’re left with just random dribbling from the nozzles. This is neither relaxing or effective. Thankfully a number of brands have stepped up and designed something to deal with this problem. Rain shower heads which have been specially designed to deal with low water pressure are now available online and we’ve identified our top 3 for you to take a look at. 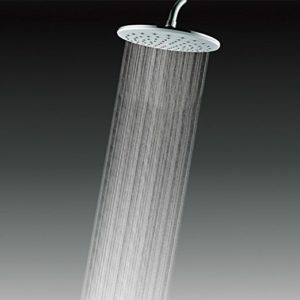 Another great rain shower head that I’ve already done a review on is the Grohe rain shower head! FabricMCC currently produce a large number of different shower heads but have shown themselves to be pretty adept at creating rainfall shower heads. With a large 9.2 Inch head the nozzles are evenly spread and this lets you get the full rainfall experience. The FabricMCC High Pressure Rainfall shower head has been specially designed to deal with low water pressure. It offers a superior performance in homes that suffer from dips in pressure and you can also remove the flow regulator for a more powerful shower. This high pressure rainfall shower head has been built entirely out of chrome which gives a classic and stylish look. The elegant silver works in just about any bathroom and adds a lot to the quality of the room. The chrome is also long lasting. It’s resistant to any dirt or damage and repels rust so the shower head can keep functioning for years. It’s also easy to clean and one wipe will usually do the trick. 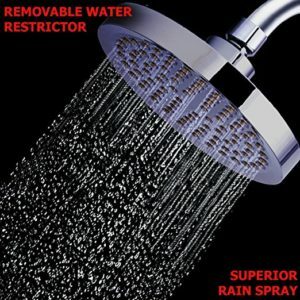 The shower head itself is made to be an effective rain shower. With a large surface area it provides an even amount of water distribution over your body and an even clean. The shower head is adjustable and there are several different settings so you can shower your way. FabricMCC tests all of their products regularly in order to make sure they’re reliable and durable. They are constantly looking to improve and the result is a range of products you can rely upon. FabricMCC have created an effective solution for those who suffer from low water pressure. It can deliver a full rainfall shower experience but they’ve also included a number of features to make the experience even better. 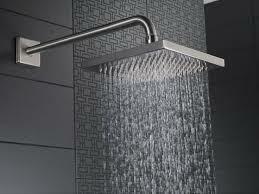 Affordable and stylish this is definitely one of the best rainfall showers around for low water pressure homes. Somov World might not be one of the most recognisable names in the industry but don’t be fooled, they’ve been around for a long time and have hundreds of different products designed to make showering more of an experience. Somov World’s high pressure rainfall shower features a 6 inch wide head allowing for complete ‘rain’ coverage. It’s one of the most powerful showers around giving consistent pressure and steady temperature. The performance doesn’t dip and even over time you’ll still get the same quality of shower experience. 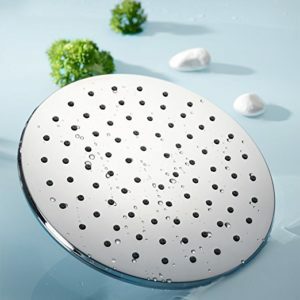 The shower head is made entirely from chrome which is one of the most durable and reliable materials used. It protects from rust and dirt and won’t need scrubbing or specialist cleaning. The shower head features self cleaning nozzles which will take care of themselves so you don’t have to. Along with this if you are interested in more cleaning options for your shower, take a look at our fiberglass shower cleaners guide, and think about using a squeegee! A built in filter in the shower head helps keep harmful chemicals and substances from your body. This includes chlorine and other elements which can cause irritation and damage to the skin. Made to be simple, installing the shower head is pretty easy and won’t require any experience or previous knowledge so you can just get on with showering. The Somov World High Pressure Rainfall Shower offers an elegant solution for low water pressure homes. The unit looks great and works perfectly with additional features that make it one of the most practical rain showers out there. Available at a reasonable price point it’s definitely one to consider for your home. Thunderhead are known for creating simple solutions to showering that benefit the user without the big price tag. While their products might not have all the bells and whistles of some competitors that doesn’t make them any less effective or useful. The Thunderhead TH2.5 has been designed as a rain shower for those with low water pressure. 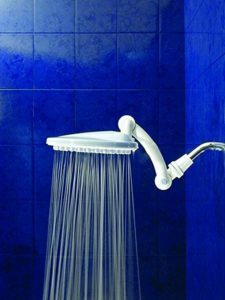 The shower head makes use of whatever water pressure is available and still provides a consistent and even flow of water. This means showering is no longer difficult and can actually be enjoyed. The Thunderhead shower head comes with a wide base and evenly spread nozzles. This gives the true feeling of standing in the warm rain and some even coverage. The Thunderhead unit is much more adjustable and manoeuvrable than the other brands which allows for more direction and focus in your showering. Perfect for the very tall or short among us the adjustable shower head is very practical. Flow restrictors are great for limiting the amount of water you use and keeping bills down, however Thunderhead have made their flow restrictor removable so you can unleash the full force of the shower head. This is a really useful feature for those with low water pressure who need as much power as can be had. The Thunderhead high pressure rain shower head is one of the most cost effective we’ve seen on the market. Available for under $50 it provides a real solution for anyone who can’t afford to fit an expensive shower head to deal with the low water pressure. The Thunderhead high pressure rain shower head is perhaps one of the less stylish options for your home but it’s still very effective at what it does. With a powerful system and adjustable height it’s practical and works in any home. The Thunderhead shower head is one of the most reasonably priced on the market so if you’re looking to solve your low water pressure issues on a budget then it could well be the one for you. Each of these rainfall showers has been designed to work with low water pressure and still give you a great shower experience. They all offer a good performance and the shower heads are durable and long lasting. 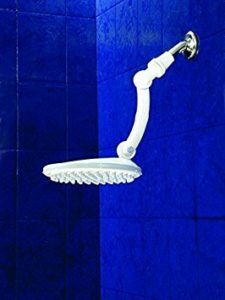 If you are looking for other types of shower heads I suggest you take a look at our reviews on our favorite metal hand held shower heads. 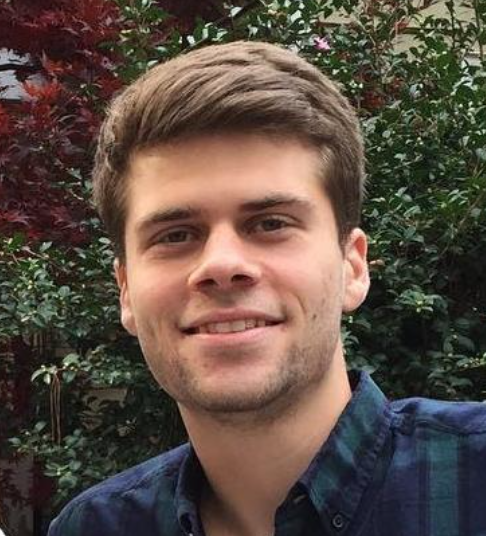 While they all have some unique features they are all fairly similar. Affordable, stylish and effective you can’t go wrong with any of these and they’re a great place to start looking for anyone after a rain shower that can deal with low water pressure. I hope you have enjoyed our best rain shower head for low water pressure households guide!